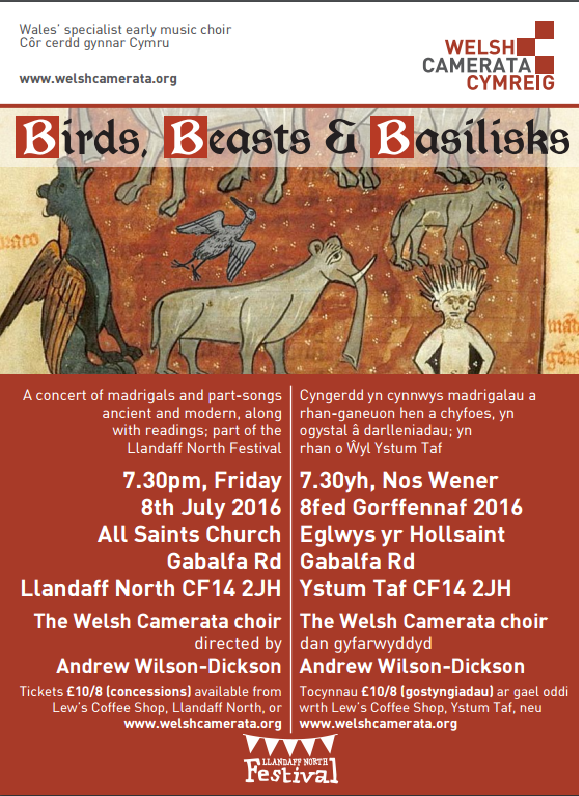 The Welsh Camerata’s concert on 8 July celebrates the sounds of summer, with a programme devoted to the animal world, from the tiny cricket to the huge elephant. The choir’s director, Andrew Wilson-Dickson, has chosen music from the 15th to 17th centuries, mainly by English composers but with some songs from France, Italy and Germany. He has combined them with a piece of his own, written in 1979 and regularly performed since then. Four Studies for Chorus and Piano from the Book of Beasts takes texts from TH White’s translation of the medieval Bestiary. “I love the innocence of the text, alongside the concept that the natural world teaches us about the nature of God, an idea that maintains its validity even when the Bestiary completely misunderstands nature,” says Andrew Wilson-Dickson. “I’m also intrigued by the free mixing of mythical and real creatures – the medieval monks who compiled the book in deepest Yorkshire were not in a strong position to tell one from the other.” Andrew selected texts on two mythical creatures (Caladrius and Basilisk) alongside the weasel and the elephant. Many of the early songs reflect on the contribution ofbirds to the musical landscape, with John Bartlet’s Of all the birds, Thomas Vautor’s Sweet Suffolk Owl and The Silver Swan by Orlando Gibbons. Other beasts include bees (John Wilbye’s Sweet honey sucking bees), the cricket (Josquin’s El Grillo) and the salamander (Thomas Crecquillon’s Si Salamandre). Johann Steffens’s Orpheus die Harfen schlug so fein describes how Orpheus’s sweet music bewitched the trees, forest, birds and animals and John Bennet’s All creatures now are merry-minded celebrates all forms of life flourishing in the summertime. The programme also includes poems, chosen and read by members of The Welsh Camerata. Tickets available from Lew’s Coffee Shop, Llandaff North; online at http://www.welshcamerata.org/concerts.php?id=94# or on the door.